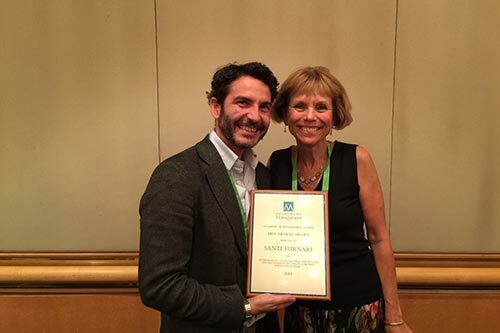 Dr Santi Furnari awarded Best Paper by the Academy of Management Review. The Academy of Management Review (AMR) is the highest ranked and most frequently cited academic journal in field of business research in the world. The AMR Best Paper Award recognises the most outstanding article published in AMR in a given year for original ideas that are provocative and make an important contribution to the field of management research. [Dr Furnari's] article showed the broadest reach in terms of relevance and implications. It has the potential to impact both research and practice. Dr Furnari’s paper advances the idea that apparently inconsequential spaces where people interact only occasionally (such as hobbyist clubs, co-working spaces, hangouts, and meet-ups) can have important long-term business consequences, such as generating new ideas and innovation. The paper identifies two conditions that these “interstitial spaces” need to meet in order to be able to generate innovation. First, they need to be designed in a way to facilitate informal and occasional interactions because people are more motivated to experiment with new ideas when they feel that there is “less at stake”. Second, these spaces need to have one or more “catalysts”–people who sustain others’ interactions over time by keeping the level of energy high and not imposing their own views on others. The paper describes the role of catalysts in detail, providing fine-grained illustrations and examples of how interstitial spaces work in practice.